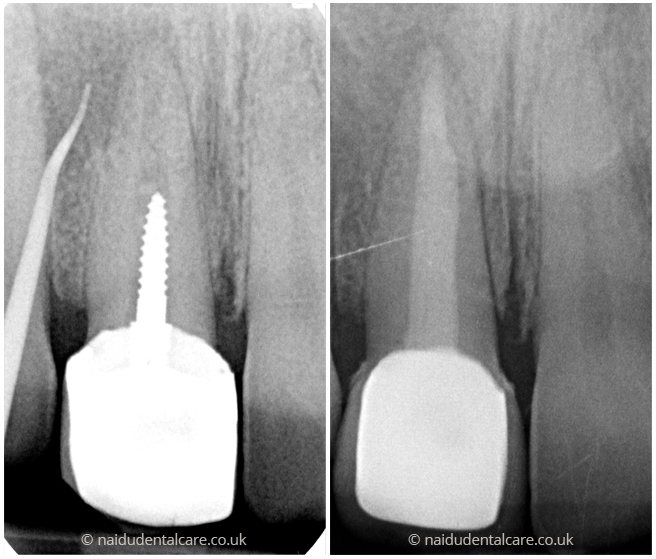 This case involved a patient with failing crowns and a failing implant that had been placed in Liverpool. These teeth had to be extracted and then replaced with a bridge replacing all the upper incisors. Louise had been unhappy with the shade of her teeth and the brown patches that she could see when she smiled in photographs. 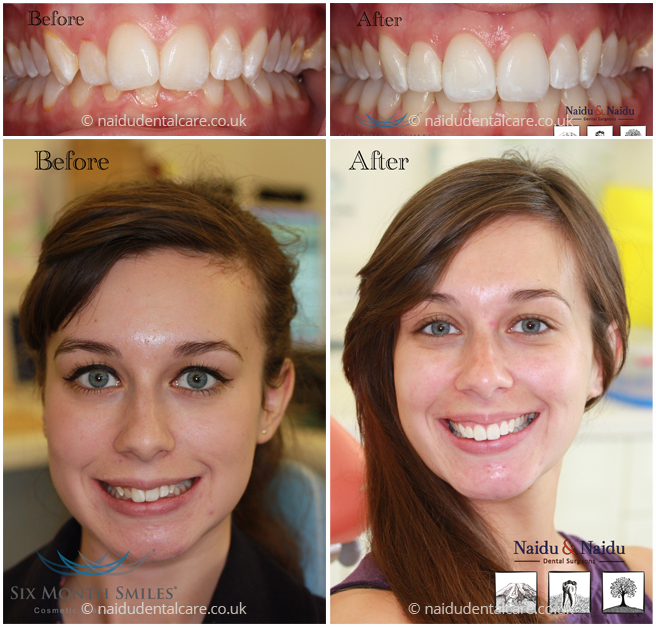 Using a combination of Enlighten Tooth Whitening and a little bit of Composite bonding, her smile was brightened and freshened! A broken down lower premolar was brought back into the smile using a metal-free crown. A zirconia crown was used with a little touch of surface staining to match the adjacent tooth and hide the large metal filling in this molar. A discreet cobalt chrome partial denture fills the gaps and gives Mr A. his smile back! Unfortunately, a complicated health history and years of medical treatment had left Mr C. with a compromised set of teeth and gums. Over time, all the remaining teeth were extracted and ultimately replaced with a set of complete dentures and giving him the ability to smile again! A single implant-supported crown replaced the missing central incisor that had been lost following an accident. A single implant and an implant-supported bridge solved the problem of missing upper incisors. Some short term braces also aligned his lower front teeth. A failing bridge was removed and the space restored with two Straumann Implants and crowns (highlighted by the arrows) to match the crown on the premolar in front of the space. A failed post-crown had broken the root of the upper right central incisor. After this tooth was removed, an implant was placed and crowns constructed for both the incisors as well as repeat root-treating the upper left incisor. This tricky case involved managing a failed full-arch upper bridge. After Adit removed the bridge and assessed the foundations, several teeth had to be extracted and Sheetal then root-treated a couple of teeth. The patient preferred not to have implants as she lived in the Seychelles and preferred options that could be maintained confidently abroad. With this in mind, Adit constructed an upper partial metal denture that was supported using precision-milled crowns on the back teeth and ball-ended attachments on two tooth roots towards the front. White filling material was used to build up the worn lower teeth and a crown constructed for the lower right first molar. This case involved broken and failing crowns on the upper teeth and worn lower front teeth. After removal of the failing crowns, the underlying teeth were increased in height with crown lengthening surgery and four metal-free crowns were placed on the upper front teeth. The lower teeth and the upper canines were built up with composite resin (white filling material) and the back teeth restored with crowns and onlays. This gentleman had lost multiple teeth and had worn the rest of his teeth over many years. This had left him severely dentally compromised both aesthetically and functionally. 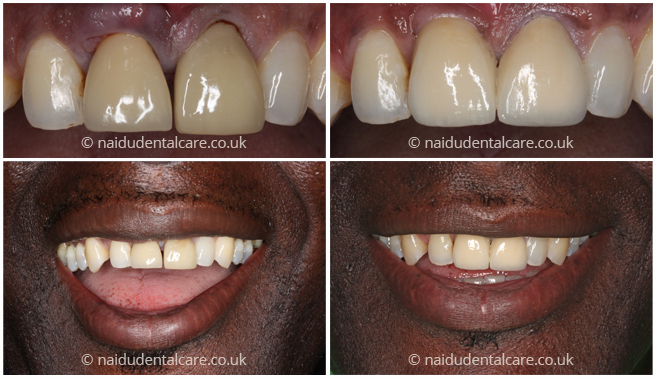 Using a combination of composite build-ups (white fillings), crowns and an upper complete denture supported on tooth roots, his bite was increased and his problems solved. Using an old photograph from his wedding day, Adit even managed to mimic his old smile by creating small spaces between the denture teeth that had been present in the past. 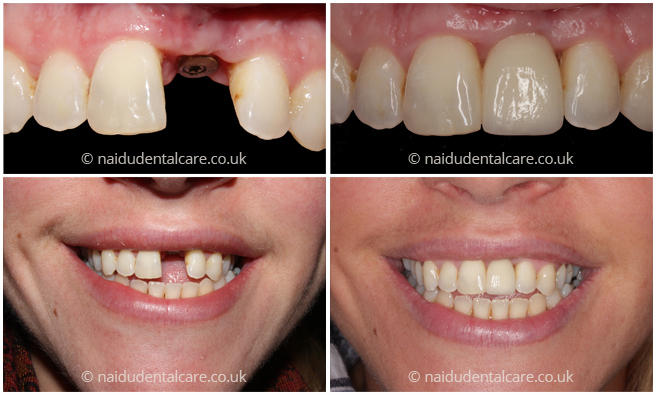 A peg-shaped lateral incisor was hidden from view and the smile improved using a veneer without having to drill the tooth. Veneers covering both the upper central incisors and a ceramic crown on the upper right lateral incisor. 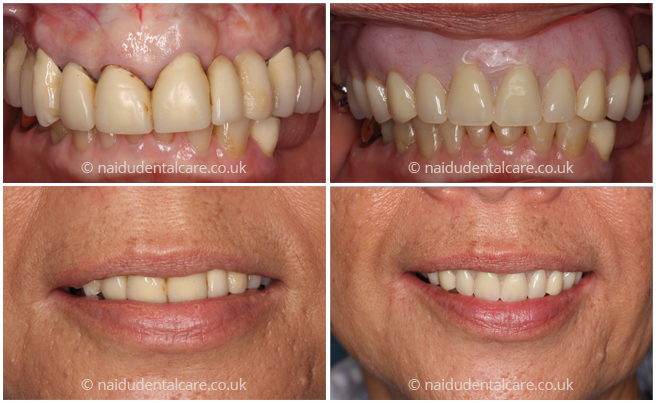 All the lower incisors were built up in one session with composite resin. White fillings are a highly aesthetic, durable and conservative method of restoring cavities. 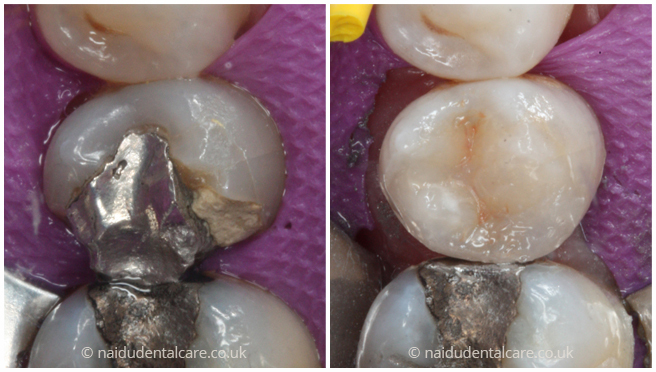 Even old white fillings can be replaced and improved using a Layering Technique to blend different shades of the material to achieve a more natural outcome. 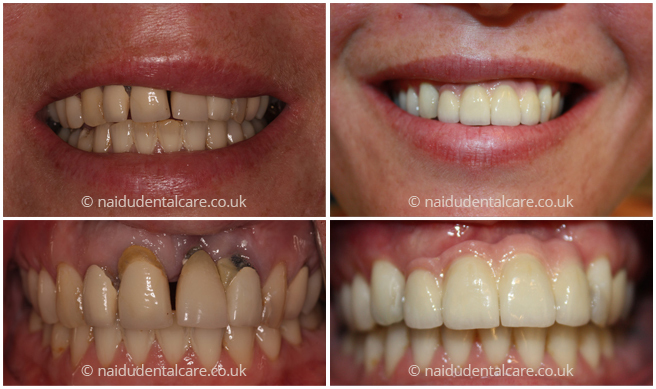 Even heavily broken down teeth can be reconstructed with composite to create a natural effect using colours and stains to mimic the surface of adjacent teeth. 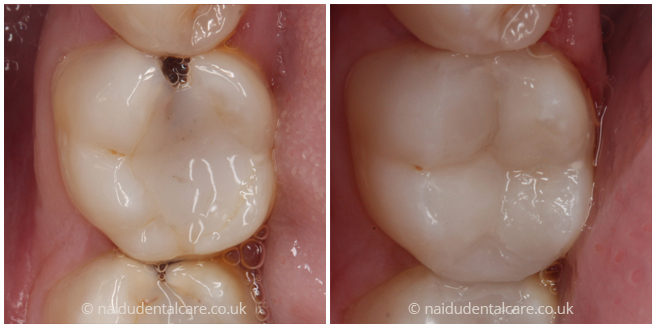 Composite Build-ups restored the tooth wear affecting the lower front teeth.